This is the wide-spectrum replacement filter cartridge filter for canister kitchen filters for all our countertop and undercounter water filters, regardless of the number of canisters. Replace these filter cartridges once a year. 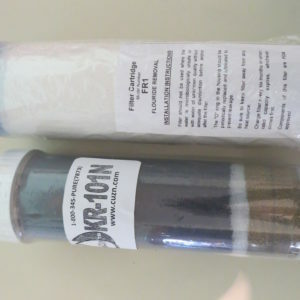 The filter cartridge contains copper-zinc and granulated carbon filtering media. 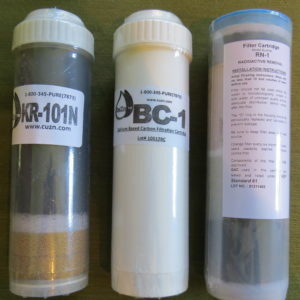 Filters chlorine and hundreds of other contaminants. 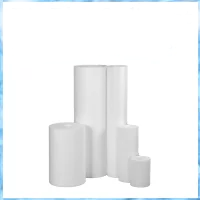 The Wide Spectrum Cartridges have the FOAM ADVANTAGE kdf, pre-washed granulated activated carbon and sediment filtration.This filter will remove PFOAs. This cartridge does not filter chloramine. Wide-spectrum cartridge with the addition of microfiber and cyst filtration is the same cartridge plus additional filtration of finer materials including small microfibers and cysts. This option uses 1 micron absolute filtration. This optional replacement filter cartridge filters water to 1 micron. This is fine enough to remove cysts. This is an alternative to the KR-101N Standard wide-spectrum cartridge. 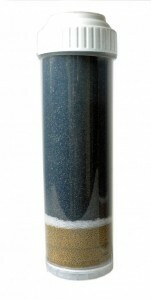 This one-micron filter will remove particles 1 micron and larger with 99.99% removal. A micron is 1/1000th of a millimeter. Click this link to our blog on microfibers. These fits all of our kitchen canister filters. 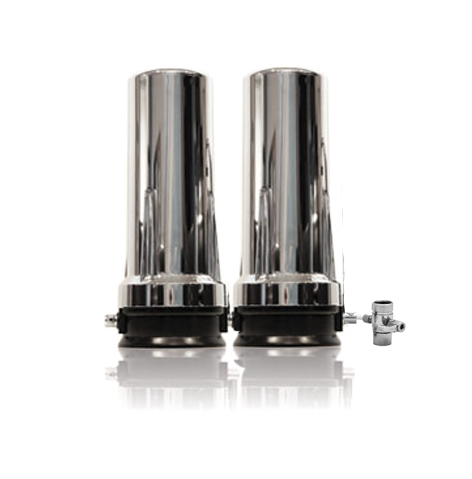 The KR101A can be used last in line in place of a KR101N on any of our kitchen canister filter systems. I have this under my kitchen sink. My city has clean water, not contaminated by industrial or agricultural chemicals, but there is a lot of chlorine in the water that makes it taste bad. I have this filter on the cold water line under the kitchen sink, so when I make fizzy water or coffee or tea it tastes good. I try to use the hot water tap for everything else to spare the filter and make it last a little longer, but it still needs to be replaced around every 7 months. I know it needs replacing when the water starts tasting like chlorine again.